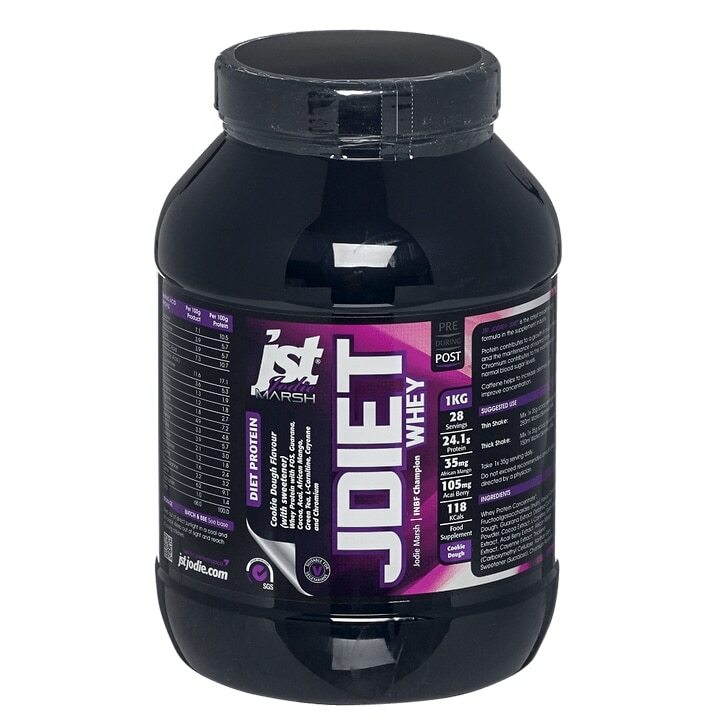 JST Jodie Marsh J Diet is a combination of Whey Protein with FOS, Guarana, Cocoa, Acai, African Mango, Green Tea, L-Carnitine, Cayenne and Chromium. Includes: . Protein which contributes to a growth in muscle mass and the maintenance of normal bone. Green Tea and Cayenne which may help to maintain a healthy weight when used alongside a healthy diet and exercise plan. Chromium which contributes to the maintenance of normal blood sugar levels. Caffeine which may help to increase alertness and concentration. Whey (Milk) Protein Concentrate, Fructooligosaccharides (Inulin), Flavour - (Vary on flavour), Guarana Extract, Defatted Cocoa Powder, Cocoa Extract, L-Carnitine, Green Tea Extract, Acai Berry Extract, African Mango Extract, Cayenne Extract, Thickener (Carboxymethyl Cellulose, Xanthan Gum), Sweetener (Sucralose), Chromium Picolinate. JST Jodie Marsh J Diet Cookie Dough is rated 5.0 out of 5 by 1.